General Motors has just announced the pricing for the 2013 Cadillac XTS, and when their new flagship full sized premium luxury sedan hits showrooms later this spring, it will carry a base price of $44,995 including destination. The 2013 Cadillac XTS will be unlike any range topping luxury sedan to ever grace the GM lineup, including premium luxury amenities, a classy exterior design and a high tech drivetrain packing features previously reserved for supercars. Today’s press release announcing the starting MSRP of $44,995 didn’t go into any detail at all but we can surmise that by “starting”, GM meant a 2013 XTS Standard with front wheel drive. The 2013 XTS comes in four different trimlines including Standard, Luxury, Premium and Platinum and while all of the trimlines include the same 3.6L V6 mated to an automatic transmission, an advanced all wheel drive is optional for the Luxury, Premium and Platinum packages. The 2013 Cadillac XTS Standard (dare we call it entry level?) offers a great many high end features, beginning with the 3.6L V6 engine offering 300 horsepower and 264lb-ft of torque while also achieving a projected (actual EPA ratings could vary) 17mpg in the city and 28 mpg on the highway with front wheel drive while all wheel drive models should get 17mpg in the city and 27mpg on the open road. The handling of the Cadillac XTS is where this new luxury car begins to share supercar qualities – featuring the magnetic selective ride control system that has previously only been found on vehicles like the Corvette ZR1, the Camaro ZL1 and the Cadillac V Series performance models. While this dual mode suspension system had been reserved for only top of the line models, it is standard on the 2013 XTS. Next, a set of Brembo high performance brakes with large lightweight rotors and performance calipers are tucked behind lightweight 19” aluminum alloy wheels…all of which is standard on the “Standard” XTS trimline. Inside, the 2013 Cadillac XTS Standard features the new Cadillac User Experience (CUE) system that seamlessly integrates all of the vehicles controls into one easy to use system. "We're taking advantage of the fact that CUE is parallel technology to tablets," Butler said. "CUE is intuitive, in part because its control and command structure aims to be consistent with popular devices millions of people already use. The App adds to this by literally putting CUE into your hands, even before you can get into the car." We can also expect that the XTS will have a luxury fit and finish that will compete with the biggest automakers in the world – including the German competition. GM hasn’t offered any detail on trimline pricing but for those who want a little more out of their 2013 Cadillac XTS, the three trimlines add even more tech goodies. The Luxury trimline adds dual exhaust, rearview camera, rain sensing wipers and front/rear park assist; Premium adds a high end navigation and tri-zone climate while the Platinum adds the UltraView sunroof and side/rear sunshades. The 2013 Cadillac XTS will be offered in eight colors – Graphite Metallic, Black Diamond Tricoat, Crystal Red Tintcoat, Radiant Silver Metallic, Silver Coast Metallic, Sapphire Blue Metallic, White Diamond Tricoat and Black Raven. Two interior packages are currently planned with either Jet Black or Shale with Cocoa accents and based on the current XTS build page, only a single 19” wheel option is planned. 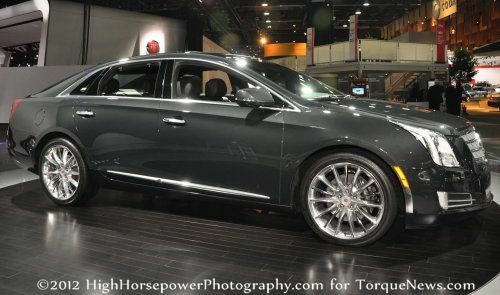 TorqueNews.com will bring you more on the pricing of the 2013 Cadillac XTS Luxury, Premium and Platinum once that information becomes available! Check out the gallery on the right by clicking to any of the thumbnails to see the 2013 Cadillac XTS on the streets of Detroit!